Webmd said: “Scientists first noticed something was up in a study that compared two similar groups: transit drivers, who sit most of the day, and conductors or guards, who don’t. Though their diets and lifestyles were a lot alike, those that sat were about twice as likely to get heart disease as those that stood”. This served as validation for me — for remaining standing during my daily commute, even when there is a seat vacant on the metro. A couple of weeks ago, an ergonomics company offered to have one temporarily installed at my work station. I was game. So a white standing desk was installed. Colleagues swung by and said, hey, what’s this, what’s going on, and proceeded to lean on it to check how sturdy this thing was. There were initial hiccups. The screen of my desktop was too heavy for the standing desk to bear its weight, effectively rendering it useless. So I brought my laptop to work and placed it on the standing desk and put in a few hours a day standing. All office software, however, was on the desktop, so I was alternating between laptop, on which I could type and edit, but other work, like making pages (the lot of us newspaper types), was confined to the desktop. After every 45 minutes, I would sit, and remain seated for another 45. I wished for a barstool to lean against. Still, I was standing more than I would otherwise, and feeling very virtuous about it. Should you get one for yourself? Try a temporary one before shelling out good money. Maybe put in a couple of hours at your kitchen counter as practice. Make sure your eyes and screen are aligned. You don’t want to be stuck with a wonky spine. In the fortnight that I had the desk (now it’s gone back to where it came from), there would be the odd day when I would ignore it — all the times I wasn’t working on the laptop. I admit, I also used the standing desk as a coffee cup holder and dump yard for loose A4 papers and old newspapers. It wasn’t a good look. Still, happy that I have no blood clots in my feet to report, neither as a result of sitting or standing. Create a long route for yourself. For example, place the rubbish bin further away than you would so that you would have to stand up and walk over to it, earning yourself five points. Park your car at a distance and walk across the parking lot. Unless it’s an indoor parking lot, in which case, park close to the entrance of building mall to avoid breathing poison air. Take the stairs, always. How many times does this need to be said? Drink more water so your bladder will nudge you to the washroom. Get those 30 minutes a day of exercise. But just because you exercise doesn’t give you a pass to sit for the rest of the day. 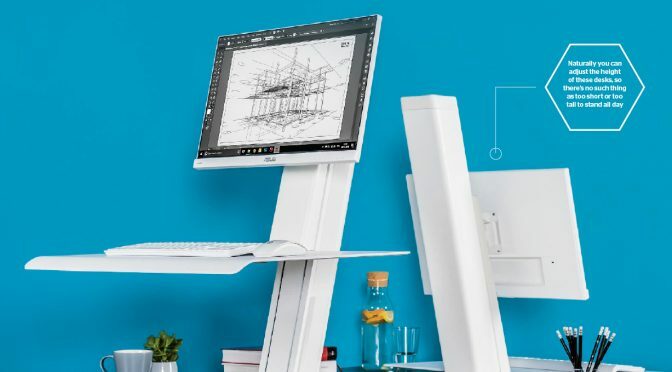 Consider getting a standing desk.